Let me start by saying, when I lived in Chicago, I would listen to you on the Thom Hartmann show every Friday with “Breakfast with Bernie”. I enjoyed those segments. I thought you had a lot of good ideas. I even felt the Bern when your campaign started last summer, until I remembered I forgot to put on suntan lotion when I was laying out. Your wife said there is precedence for you to stay in the race until the Democratic National Convention and mentioned Ted Kennedy in 1980 and Hillary Clinton in 2008. In 1980, Kennedy did take the fight to the convention and tried to get pledged delegates to Jimmy Carter to flip. Senator Kennedy fought for a more liberal party platform and on the last day he ignored President Carter on stage. 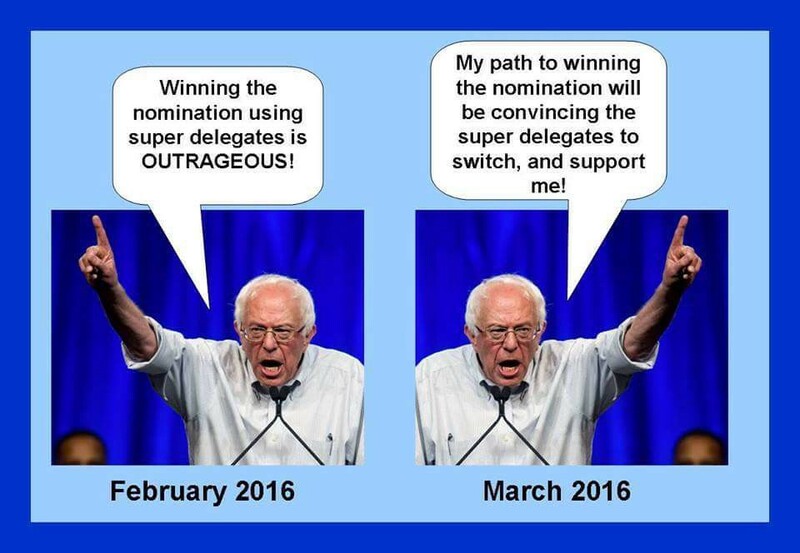 Somehow Senator Sanders, I see you doing the same thing this year in Philadelphia if you continue your campaign past DC. 2008 is a different story. On June 7th, Hillary Clinton suspended her campaign. Neither Hillary or Barak Obama had enough pledged delegates to secure the nomination. Nor did they have enough with the Super Delegates factored in. 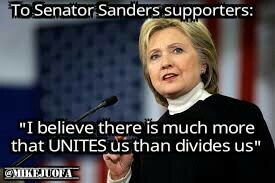 Hillary and Obama were closer together in delegates and votes than you are with Hillary this year. Hillary chose what was best for the party and endorsed Obama instead of going to the DNC in Denver and fighting for Super Delegates which would had hurt the party. Just a few days ago I wrote a blog saying I respected your decision to stay in the race until the last primary is over in DC. Following what you, Dr. Sanders and Jeff Weaver have said over the weekend, I changed my mind. It is time for you to suspend your campaign Senator Sanders for the good of the Democratic Party that you now claim to be a member of for life. Your campaign has given a few reasons why to take the campaign to the Democratic National Convention. As a member of the Democratic Party since 1985 when I turned 18, I disagree with your reasons aka excuses. “Most of the Super Delegates had already endorsed Hillary. They haven’t had a chance to get to know me”. The members of Congress including 45 other Senators of the Democratic Caucus and the governors of your home state of Vermont didn’t know you? You have 1 Super Delegate vote from the Senate in addition to yours. Those that endorsed Hillary have had almost a year to change their mind if they wanted to. Is the real reason you don’t like Super Delegates is because you have so few and has bruised your ego? The Super Delegates should follow what the voters of their state did. Hillary won Arizona. I don’t hear you telling your Super Delegates in my state to change their vote to Hillary. 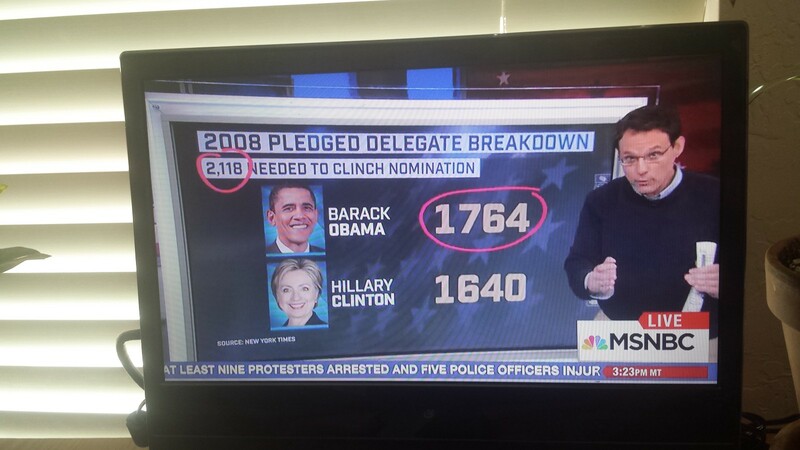 MSNBC on 2May showed what the delegates would be like if it was how you want it. You are still behind in both pledged and Super Delegates. FiveThirtyEight.com broke the pledged delegates down 3 ways Dem rules, GOP rules and proportionally. All three ways Hillary is ahead. Using GOP rules, she would have even more of a lead. You beat Trump by higher levels in polls. A 4% victory and a 12% victory equals the same amount of votes in the Electoral College. What will those polls look like once the GOP, Karl Rove & the Kochs start running negative ads against you. Outside of Vermont you are pretty much an unknown quantity. They have their chance to paint you to those voters who only start paying attention during the general election season. I do not think you would be able to recover from such attacks. 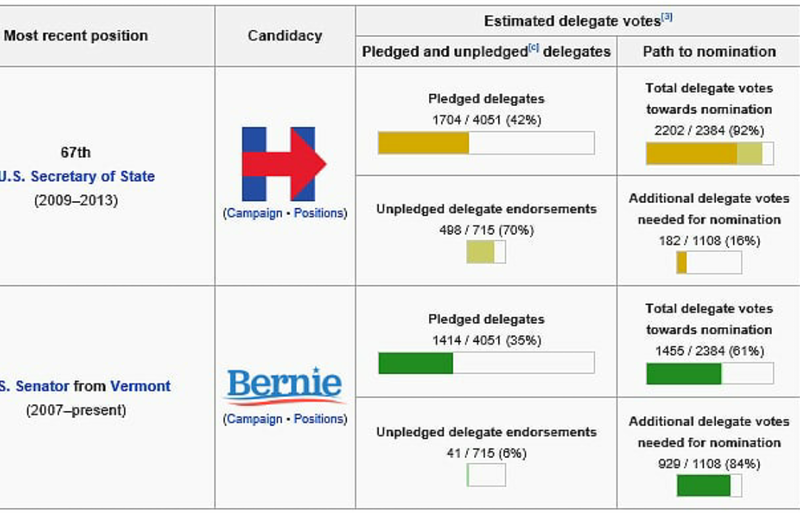 At this stage in the primary season, the amount of pledged delegates that you need vary depending on the source. 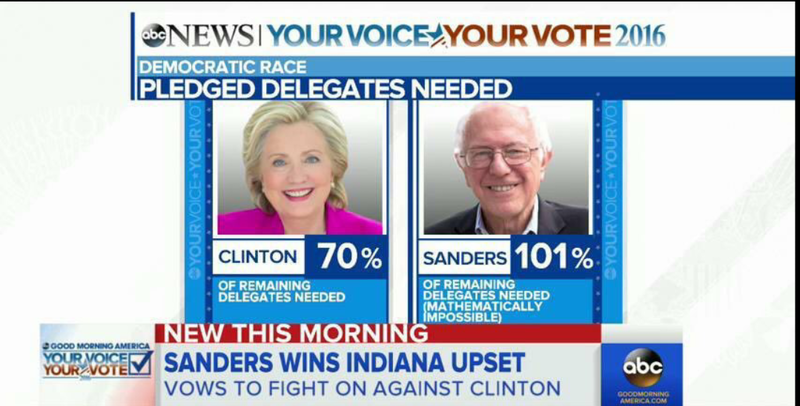 ABC estimates you need 101% of the pledged delegates. That is not going to happen. #FeelTheMath. thegreenpapers.org estimates you need 84% of the remaining delegates (pledged & Superdelegates). There is more chance of Donald Trump saying he was wrong with the Birther movement than you passing Hillary in delegates. At this point what is keeping you in? Is it your ego? 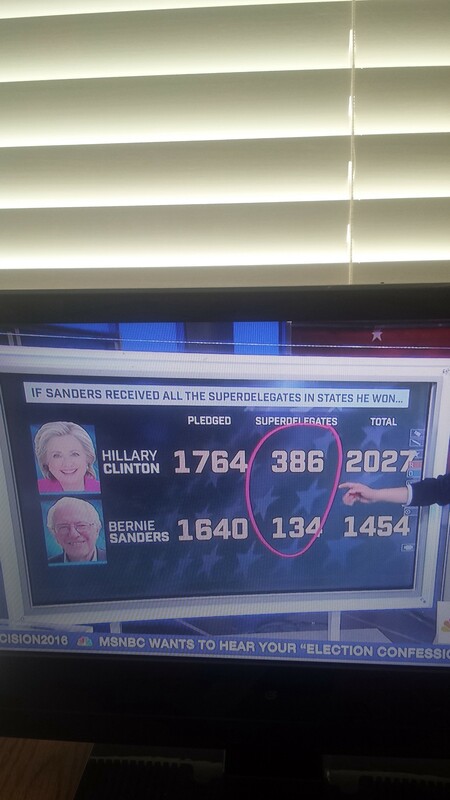 How can you honestly say that if Hillary is leading in pledged delegates that the Super Delegates should flip to you? MoveOn.org, a SuperPAC who supports you said in one of the organization’s petitions “The race for the Democratic Party nomination should be decided by who gets the most votes, and not who has the most support from party insiders…”** At one time, your campaign said the same thing. Now to stay in and try to flip Super Delegates when you are behind in not only votes but pledged delegates is in my opinion for pride, money or both in my opinion and most importantly hypocritical. Explain to me Senator Sanders how is flipping delegates democratic if you are behind in votes and more importantly pledged delegates? I thought you wanted the will of the voters to prevail. What would happen if you pulled out a victory in California and by large enough of a margin to make any kind of difference (I doubt you would get 78% of the vote in California), but lost Nancy Pelosi’s district? Shouldn’t Nancy follow the will of those who directly elected her to serve as their representative and vote for Hillary? Do you think the Super Delegates that are party leaders will change to you willingly after you have complained about the Superdoelegate process, the Democratic Party as a whole (while running to be our standard bearer) and excuse after excuse why you are behind (Deep South, closed primaries, poor people don’t vote). One of your surrogates referred to “Democratic Corporate Whores”. You have not had any joint fund raising events for the party which will be needed to help elect Democrats in the fall. Those are the same people that will be needed to carry out the Democratic Party agenda and to #TurnTheSenateBlue. With the way you have talked about the party, do you honestly think you have any kind of chance in flipping these party leaders? I think my odds of winning the lottery. Stop listening to Jeff Weaver and Tad Devine. They are in it at this point for large paydays. The longer you keep your campaign going, the more money they make. Think of your party and your country. If you insist on continuing your campaign through DC and then on to Philadelphia, tailor your speeches against Trump and the GOP and how the Democratic Party is best for the American worker. Talk about themes that you and Hillary have in common. Be like Senator Warren in your speeches and go after the policies of the GOP and Trump, not the policies of YOUR party. Better yet, it is time for you to stand before the country and say #ImWithHer and mean it.